Let’s get upset about the internet getting upset about things! 0:00 – We talk about IT even though neither of us have seen it. 12:17 – Google labels us a file sharing site for… hosting our own podcast? 18:19 – All of YouTube’s changes are terrible. All of them. 29:35 – My patience pays off! Both Resident Evil 7 and L.A. Noire get Gold/Deluxe editions that include all the DLC! 49:32 – Nintendo character profiles for Mario and Luigi mention the boys used to work as plumbers, internet loses its damn fool mind. 59:34 – South Park video game ties difficulty to skin color. 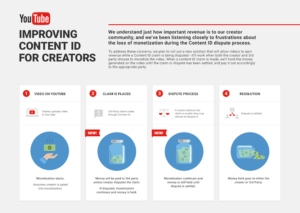 Since Google launched its Content ID program on YouTube, it has been plagued with problems. The biggest problem is that anyone can claim a video without having to provide anything resembling proof. Additionally, when a video is claimed, the original creator completely loses control over the monetization of their work.